To put the “Sound of Europe” on the big stage is the mission of “Jazz at Berlin Philharmonic” and of its curator Siggi Loch. Earlier concerts in the series – tracking down “Celtic Roots” or strolling through “Norwegian Woods” – have shown how the sheer plenitude of European music has left its mark on the jazz of our time. Many of the roots of European music are to be found in Italy. The country was an early hub for Western classical music, and was where opera was born. From Sicily up to Venice, all kinds of gloriously diverse and many-hued folk music heritages are nurtured. There is a nationwide tradition of the “cantautore”, and in film music, Italy sets the trend: Nino Rota's and Ennio Morricone's movie scores are known worldwide. “Mediterraneo” avails itself of this cornucopia of inspiration – and sets off on a journey of discovery. The 17th concert in the “Jazz at Berlin Philharmonic” series was a major event which took place in the sold-out main hall of the hallowed temple of classical music. The central figure of the evening is Stefano Bollani. This maestro of the jazz piano, born in Milan in 1972, is a figure of unrivalled prominence on the Italian jazz scene. His creative arc is uncommonly far-reaching. It ranges from working with senior figures like Lee Konitz, through luminaries like Chick Corea, Pat Metheny and, of course, his longtime partner Enrico Rava, French innovators such as Michel Portal and Martial Solal, and on to world music greats such as Caetano Veloso and Richard Galliano. 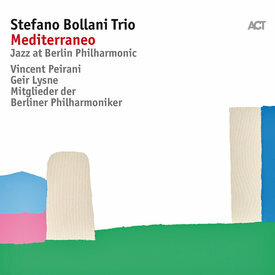 So, for “Mediterraneo”, it was important for Bollani to cast his net wide, to shape an evening that would be full of variation and surprise; the Italian is not content just to perform for the audience, above all he wants to entertain them: alongside Monteverdi, Rota and Morricone, Puccini and Rossini, there was also the evergreen sixties pop song “Azzurro”, made famous by Adriano Celentano. Bollani emerged as the ideal travel guide for this Italian night. With his completely individual virtuosity and his enjoyment in playing, his Mediterranean ease and well-judged injections of humor, Bollani takes the listener on the Grand Tour through the music of his homeland. Right by his side an exceptional rhythm section with the two Danes: Jesper Bodilsen and Morten Lund, plus a star guest on the accordion, Vincent Peirani, and 14 intrepid members of the Berliner Philharmoniker. They don't just bring a cultured sound, they also prove refined improvisers. The Norwegian Geir Lysne wrote the arrangements for the concert, and also directs the musicians through this Italian night. He is an ideal partner for Bollani. They have already won an ECHO prize for their work with the NDR Bigband. Both are musicians who like to make discoveries and spring surprises. Lysne is an extremely deft experimenter in sound. He uses unusual instrumentation to bring a richness of timbre, and also brings tension and a unique feel for groove, placing musical material into wholly new and unexpected contexts. And then there is Vincent Peirani. Raised in Nice, the most visible face of young French jazz, the accordionist is a talented storyteller. He had already shone at the “Accordion Night” in the Berlin Philharmonie. This time, in his tightly meshed interplay with Bollani, he ensures that there is additional Mediterranean flair, and his cultured playing brings heart-stopping moments of excitement and surprise. The well-known themes by Ennio Morricone from the spaghetti western movies are kept aside for Peirani. They are showpieces for him at his absolute best. Bollani and Co. delivered utterly compelling passages of music, and touched the hearts of the audience. “Mediterraneo” wasn't just a unique musical occasion. It also proved a point: Europe has so much to offer.